In order to speed up this restoration and development [of agricultural production and industrial production in small towns], we must do our utmost, in the course of our struggle for the abolition of the feudal system, to preserve all useful means of production and of livelihood, take resolute measures against anyone’s destroying or wasting them, oppose extravagant eating and drinking and pay attention to thrift and economy. To “oppose extravagant eating and drinking,” however, is not exactly a hallmark of the typical Chinese restaurant, where extravagance is the norm. I think that much of what comes to mind when one says “Chinese food” – be it President in Binondo or Chowking – we owe to the oppressive dynasties deposed by Chinese revolutionaries. After all, things like the banquet and lauriat were built on the backs – and the farms – of the proletariat. And of course, there’s Mao Zedong the gourmand: his penchant for spicy dishes, particularly red-cooked pork, for example, was as strategic as it is tactical to vanquish… well, capitalist pigs. But that – the historical notes or remarks devoid of any historical origin whatsoever, are digressions. 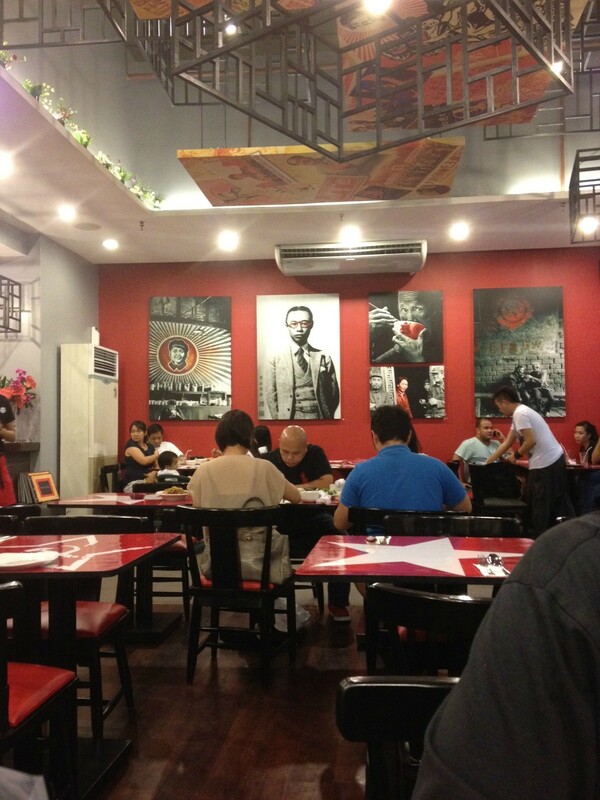 Enter Komrad: a Chinese restaurant somewhere in Tomas Morato, where the leitmotif (ding ding ding) is, well, Mao Zedong. So off we went to Komrad for a light dinner (usually because I turn into a pig whenever one mentions “dinner”). Is it good? That I’m not sure of: The Girlfriend gushes over the just-right spiciness and kick, and compliments the restaurant for that difficult balancing act of making you feel full without making you feel bloated. She’s right, of course, on those counts, but I have mixed feelings for it. The garlic dumplings are great, but Causeway is just a few blocks away from the restaurant in Il Terazzo. Served on a hot sizzling plate with plenty of green onion and fried garlic as garnish – and served with the spicy soy-chili sauce that Jam and I really like – there’s something amiss. When you take the sauce away the siomai just feels – and tastes – frozen and pre-packaged, made different and perhaps even unique by serving it like a sizzling plate potsticker. Is it good? Yes. Is it great? Not exactly. I’d order this, but Komrad is not a yum cha place by any standards. The beef in spicy pot is a semi-yes for me. I like it because the beef was fork-tender and it wasn’t insanely hot as expected from some Chinese restaurant. At the same time, it lacks heat: it tasted, at least to me, like a hastily tossed-up curry with large garlic cloves and some long pods of green pepper that felt a little limp and didn’t have kick. It went well with the rice, but somehow I wanted the garlic to be a little more discreet and the sauce a little spicier. This one needed the dimsum sauce to really bring out the natural strength of the beef, which tasted quite fresh and not frozen. The real star – and somehow the real letdown – had to be the prawns in X.O. Sauce. I read in other food blogs that this Red Crab restaurant eschews the “traditional Chinese menu” for more modern fare, but X.O. Sauce is just a bit too predictable in what passes for modern Chinese cooking today. The done-to-death recipes like chili crab, kung pao chicken, chop suey, egg foo yung, yangchow fried rice, General Tso’s chicken, and so on and so forth. For this dish, there were a few prawns that had that soft shell – export seconds, perhaps – but it didn’t detract from the overall pleasant quality of this dish. Surprisingly, it tasted like prawn – with very fat and juicy heads that were, in my view, superior to the meat – and not something drowned in X.O. Sauce with a few peppers and garlic bits thrown in to make the dish seem “Chinese.” This didn’t have that vibe at all. It’s definitely something worth eating again. I’m sure I should make a few more trips to Komrad to have a better view of things, but prices are a bit steep, bourgeois even. It’s not an everyday thing, but the prices are reasonable for anyone looking for a fix of Chinese food. And the service begs a LOT of compliments here: fast, efficient, polite, clean. This is the first Chinese-themed restaurant I’ve been in where the finger bowl and (non-Good Morning) towel is immaculately clean. So what do I think of Komrad? I’d definitely go back, perhaps for a serving of kung pao or rock lobster and fish head if I’m feeling a bit more extravagant, but it teaches me that valuable lesson that Chinese motifs do not make Chinese food. Komrad, for the moment, toes a very tenuous, tight line between excellence and the middling ways of any other Chinese-themed restaurant. Would Mao himself like it? Probably not, but I do: in a few ways and some constructive comments that can only come to a restaurant that has every chance in the world to be great and noticed. Just a little more spice, a little more freshness, and a little less focus on the “modern Chinese” and more on the things Mao would actually like, and this restaurant’s gonna be great.